John Vanderhorst paid £360 for 540 acres (1). 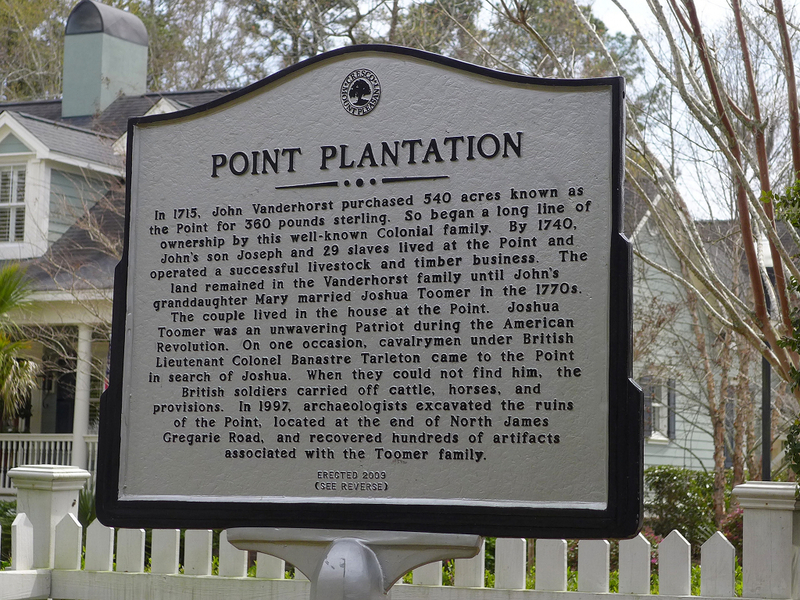 1740  John's son Joseph Vanderhorst lived at the plantation ? (1). 1770s  John's grandaughter Mary and her husband Joshua Toomer owned and lived at the plantation (1). 1784  Joshua Toomer married William Vanderhorst's daughter Sabina after the death of Mary. Joshua and Sabina combined the neighboring Richmond Plantation and Point Plantation (1). 1796  The property passed to Joshua and Sabina's son Anthony V. Toomer (1). 1856  The plantation remained in the Toomer family until this year (1). 1997  Only ruins remained of the plantation. Archaeologists found hundreds of articfacts associated with the families that once called Point Plantation home during an excavation of the property (1). There had been a house on the plantation.